Why did Charles Lindbergh perjure himself to send an innocent man to the electric chair? 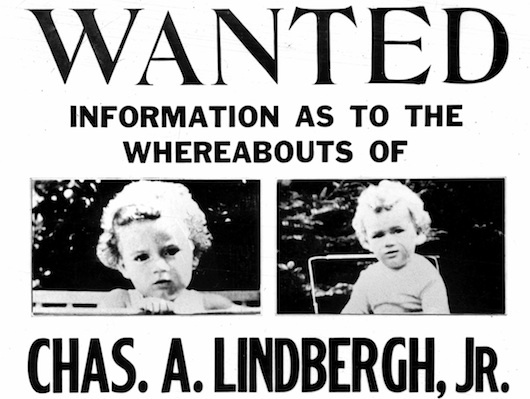 Would the arrest of the murderers of the Lindbergh child have prevented the entry of the United States into World War II? Why did "Editor and Publisher", the house organ of the journalism industry, note on the Hauptmann trial, "No trial in this century has so degraded the administration of justice."? These questions are raised, but not answered by a painstaking examination of the Lindbergh kidnapping in "Scapegoat" by Anthony Scaduto. Published two years ago, it proves that Hauptmann was innocent and that he was convicted solely by suborned perjury from the Jewish prosecutor, David Wilentz. Scaduto found the paybook of Reliance Property Management and photographed the page showing that Hauptmann was working in New York on March 1, 1932, when the baby was kidnapped. Wilentz not only hid the paybook in police files where it remained for forty years, but got the timekeeper to testify in sworn testimony that Hauptmann had not been hired until March 15! Wilentz had an eighty-seven year old New Jersey neighbor of the Lindberghs, Amandus Hochmuth, testify that at one p.m. on the day of the kidnapping, Richard Hauptmann drove up to him, told him his name, and said he was looking for property in the area. Yet Social Security records showed that Hochmuth was legally blind from cataracts and was also senile. At the time of Hochmuth’s testimony, Wilentz was concealing the Reliance paybook which proved that at the very hour that Hochmuth claimed Hauptmann was conversing with him outside the Lindbergh home, he was actually working in New York! When J. Edgar Hoover learned that the Jewish prosecutor Wilentz was manufacturing evidence and preparing a horde of perjured witnesses to testify in the Hauptmann trial, he hastily withdrew the cooperation of the FBI in the prosecution. Foreseeing a complete debacle, he remarked to his associate, Clyde Tolson, "Goddamit, I don’t know if Hauptmann is going to jail, but I’m sure Wilentz will." Governor Hoffman of New Jersey later wrote in Liberty Magazine that J. Edgar Hoover informed him that he and the FBI had formally withdrawn from the case on October 10, 1934. This was three weeks after Hauptmann’s arrest, when Hoover’s agents reported to him that Wilentz and his chief co-conspirator, the Jew Col. H. Norman Schwartzkopf, head of the New Jersey State Police (Schwartzkopf means "blackhead" in German; [father of General Schwartzkopf of Gulf War fame]) were concocting a completely phony case against Hauptmann. Despite Hoover’s hunger for publicity, he was forced to sit on the sidelines throughout the most famous trial in American history. However, the FBI tour in Washington ever since has included a lengthy discussion of the Hauptmann case, with great emphasis on the role played by the FBI agents in the locating and arrest of Hauptmann. Actually, the arresting force included one FBI agent and nine New York and Jew Jersey policemen. Of course the tour guides never inform the gaping public that Hoover refused to participate in the trial because all of the evidence presented by Wilentz, with the exception of the ransom money, was completely phony. For more than two years, the Scaduto revelations have ticked away like a time bomb, threatening to topple the unholy combine of Jewish officialdom and the Jewish-controlled press which holds power in the United States. Because of its ramifications, it has been ignored by the press, of which Scaduto was a member in good standing, having been a reporter for the Schiff-owned New York Post. Instead of winning a Pulitzer prize for his brilliant journalistic research on the Hauptmann trial, Scaduto has been relegated to limbo, and his great work on this case is never mentioned. He has no idea of the real forces at work, and apparently has never heard of ritual murder. Indeed, he naively ascribes the Lindbergh kidnapping to a plan by the Mafia to force Lindbergh and other pilots to stop reporting sighted stills seen in their mail runs! In fact, Lindbergh had never reported but one still, which he merely noted in his flight log, and did not even report it to the authorities! It becomes the task of this writer to answer the questions raised by the Scaduto book. Why did the world’s most famous hero, Charles Lindbergh, cooperate with the murderers of his child and perjure himself to send an innocent victim to death? A typical gentile, he was putty in the hands of the wily Jew, Wilentz, who quickly converted him into a robot-like shabez goy, repeating only what he had been told to say. The facts are a matter of record. On the night of April 2, 1932, Lindbergh had accompanied his go-between, Dr. Condon, known as Jafsie, to St. Raymond’s Cemetery in New York for the payment of the $50,000 ransom. Lindbergh had remained in the car while Dr. Condon carried the ransom money into the cemetery. He was unable to see the kidnapper, who finally whispered to Condon, "Hey Doctor." This hoarse whisper, some three hundred feet from Lindbergh in the closed car, was barely heard by him. He testified at the Bronx grand jury indictment of Hauptmann that he positively could not identify Hauptmann’s voice! These grand jury files remained sealed for more than forty years, until Scaduto obtained access to them. During the Hauptmann trial in New Jersey, Wilentz became fearful that the parade of perjured witnesses he and Schwartzkopf had suborned, as well as the clumsily manufactured evidence against Hauptmann, was having little effect on the jury. In fact, the testimony of senile witnesses like Hochmuth was prejudicing them in Hauptmann’s favor. One of his star witnesses was Albert Osborn, the famed handwriting expert, who positively identified Hauptmann as the man who wrote the ransom notes. It was this same outfit of Osborn and Osborn which more recently positively identified Clifford Irving’s forgeries of Howard Hughes’ handwriting as being "unquestionably genuine", thus enabling Irving to defraud his publisher of $300,000. To understand Wilentz’ predicament, we should realize that he was a typical Jewish fraud and loudmouth. Although he was prosecuting the most publicized case in American history, Wilentz had never before tried a criminal case of any case! Like most Jewish officials, he had not been elected to the office of Attorney General of the State of New Jersey, but had been appointed by Gov. Harry Moore as a political payoff after he had persuaded a number of Jews to switch their votes! If he could get a conviction against Hauptmann, he was assured he would become the first Jewish Governor of New Jersey, and perhaps follow Woodrow Wilson’s example in moving from that office into the White House. Since he had nothing to connect Hauptmann with the kidnapping and murder of the Lindbergh child but the possession of the ransom bills, he and his fellow Jew, Schwartzkopf, enlisted the state police in manufacturing a phony ladder and other evidence, and rounding up a group of perjured witnesses who would place Hauptmann at the scene of the crime. Because more than a dozen persons were involved in Wilentz’ conspiracy, it was inevitable that J. Edgar Hoover and other officials would be warned of what Wilentz was doing. It was even more imperative that Wilentz convict Hauptmann in order to protect the real murderers, the Jews who actually kidnapped and ritually murdered the baby. As a Jew, it was his duty to his tribe not only to erase all leads to the true killers, but also to prevent the public from learning any details of the nature of the crime, a Jewish ritual murder. This was the real reason that Wilentz had taken the unprecedented step of a state attorney general personally taking over the case, which otherwise was even more inexplicable since he had no experience in organizing and directing a criminal prosecution. Traditionally, a state attorney general would remain in the state capitol, and would select a prosecutor who would personally report to him on the developments in the case. Yet all of the hundreds of reporters at the trial unquestionably accepted the explanation that "political ambition" was the sole reason for Wilentz’ unusual behavior. Coached by Wilentz, he returned to the courtroom, and testified, "I heard very clearly a voice coming from the cemetery ... In a foreign accent, ‘Hey Doctor’ ... That was Hauptmann’s voice." Wilentz had achieved one vital goal; he had turned the trial into a circus. Hundreds of reporters and thousands of spectators had swarmed into the little town of Flemington, New Jersey, and tried to batter their way into the Hunterdon County Courthouse. Wilentz’ opponent in the case, Ed Reilly, had from the beginning played Wilentz’ game. Inexplicable at the time, it now seems to have been no accident. Big Ed Reilly, known as the Bull of Brooklyn, had defended more than two thousand clients, most of them accused of murder. Many of them were mobsters, for whom he won acquittals, earning fabulous fees in the process. Now fifty-two years old, he looked sixty-five. Red-faced, with a tremendous paunch and thinning hair, he had been an alcoholic for years. He had spent several million dollars in high living, and was paying alimony to four wives. He was nearly bankrupt, and his law practice had dropped alarmingly. Yet this was the man whom an unusually generous William Randolph Hearst had hired to defend the penniless Hauptmann, for a fee of $300,000! It was well known that Hearst wanted a conviction. He was haunted by the fear that one of his children would be kidnapped, with a probable demand for a million dollar ransom, which he would have difficulty in paying. He had already relinquished control of the Hearst newspapers to a Jew, Richard Berlin. Few people knew that the Hearsts themselves were Jewish, the original name having been "Hirsch". This fact gave further dimension to Hearst’s interest in the case. He had forbidden any reporter to ever mention the words "Jewish ritual murder" in any story. Thus he had a common bond with Wilentz in seeing Hauptmann convicted. This meant that Reilly’s lackluster conduct of the case was due to more than his failing memory and his alcohol blurred speech. Reilly had refused to cross examine Hochmuth about his 87 year old memory or his loss of eyesight. He was famed as "the Bull of Brooklyn", a man who could tear any witness’s testimony to shreds with a few sardonic thrusts, yet not a single prosecution witness was attacked by him. Although Hauptmann knew that all of Wilentz’ witnesses were perjuring themselves, including Lindbergh, he never had an inkling that he had been set up with Reilly as his attorney. The $300,000 fee proved to be a profitable investment for Hearst, as his accountants later found that the additional revenues generated by the coverage of the trial totaled more than eight million dollars! When Fisch did not return, Hauptmann opened the box. He saw the ransom money. Not knowing that Fisch had set him up, he began to spend part of it, offsetting the $5,500 Fisch owed him. However, he did keep meticulous notes of money taken from the box, indicating that he expected Fisch to return for an accounting. Unlike Hauptmann, Fisch had been definitely linked to the Lindbergh household, for he had been seen a number of times with a twenty-eight year old English girl, Violet Sharpe, who worked there as a maid. After the police questioned her about the kidnapping, on June 10, 1932, she was found dead at the Morrow household. A can of potassium cyanide was nearby. There was no record of its purchase by anyone in the household, and it could not be traced to any store in New Jersey. No one had ever seen it or knew what it was used for. Schwartzkopf’s police promptly ruled the death a "suicide", and made no attempt to trace the cyanide, after deciding that Violet Sharpe herself had brought it there. As she was the only person in the household who could identify the kidnappers, there is little doubt that she was murdered and that Schwartzkopf’s police were guilty of collusion in covering up the murder. Several Christians, aware that Hauptmann had been railroaded, now began a desperate struggle to save his life. At their own expense, and with no personal involvement in the case, they sought only to work for justice. One of these men was Ellis Parker, former chief of detectives of Burlington, New Jersey, and considered one of the most brilliant and incorruptible detectives in America. Having known Lindbergh’s father-in-law, Dwight Morrow, for some years, he went to Morrow and told him how Wilentz had faked the evidence. He asked only that Morrow persuade Lindbergh to ask for a commuted sentence to life imprisonment while he gathered evidence on the real killers. Morrow’s health was failing rapidly, as he had been overcome by the horrible death of his grandson and the resulting publicity. Nevertheless, in June of 1935, he summoned Lindbergh for a confidential talk. Meanwhile, Ellis Parker had located the real kidnapper of the Lindbergh child, a man named Paul Wendel. Wendel had been Isidor Fisch’s lawyer, and had regularly dated Violet Sharpe, who set up the kidnapping. Wendel’s sister lived behind St. Raymond’s Cemetery. This was the reason this spot had been chosen for the delivery of the ransom money. Parker had Wendel sign a full confession. When he turned Wendel over to the police, Wendel immediately repudiated the confession and accused Parker of kidnapping him! Parker and his son were convicted under the new Lindbergh kidnapping law, and sent to Lewisburg prison. A few months later, Parker died in prison. His gallant effort to aid Hauptmann had cost him his life. As this writer has spent thirty years investigating Jewish ritual murder, the entire handling of the Lindbergh investigation shows the typical reactions of Jews to this crime ... the furious activity of Jewish officials such as Wilentz to cover up all traces of the true murderers, and to find a gentile victim who can be accused of the crime. Was it a coincidence that Richard Hauptmann shared his home in the Bronx with Victor Schuessler? Victor Schuessler was the grandfather of the two Schuessler boys who were murdered in one of Chicago’s most famous cases of Jewish ritual murder! The ritual murder of the blond, blue-eyed Lindbergh child was a crime so horrible that it leads one to cry out, "Is there no pity under Heaven?" But, seen in its context, this crime, had it been solved, could have led to the saving of millions of lives in the approaching Second World War. Today, the Lindbergh case is more important to us than ever before, as a symbol round which "the wise and the good can repair", a cross upon our banner behind which we can rally, as did the Emperor Constantine, to march forward once more to bring the benefits of white civilization to a suffering world. Charles Lindbergh’s escape from the world of reality was to be short-lived. Even while he was soaring across the Atlantic, subterranean forces were at work which would bring him lifelong sorrow. In New York, the misshapen Franklin Delano Roosevelt was already gathering about him the crew of diseased cripples who would inaugurate a Jewish dictatorship in the United States. As the year of 1932 dawned, they had succeeded in capturing the Democratic Party, and the road to the White House was unencumbered. Herbert Hoover, the likely Republican candidate, had already been saddled with full blame for the Great Depression, which had been caused by classic gold movements of the Jewish international bankers. Suddenly a threat appeared on the horizon. A panicky subordinate informed FDR that the Republican Party leaders, despairing of re-electing Herbert Hoover, had made overtures to Charles Lindbergh to accept the Republican nomination. In fact, his father-in-law, Dwight Morrow, one of the Republican party leaders in New Jersey, had suggested to him that he should seek the nomination, but he had refused. FDR’s crew did not know this, and they were appalled at the possibility that the handsome blond world hero would oppose them. There would not even be an election; he would simply be elected by acclamation, as the ancient Roman emperors had been. The crippled Roosevelt would roll his wheelchair back to his mother’s estate in ignominious defeat, destroying the plans for world dictatorship of the sinister crew of Communist degenerates, Frankfurter and Bela Moskowitz, who had made his meteoric political rise possible. Something must be done, something so drastic that Lindbergh would abandon all thought of public office. We must now ask, "Would the Jewish conspirators, who had sent federal agents to wreck the Lindbergh home, sabotaged his plane, and drugged his thermos, actually murder a helpless child in the furtherance of their plans?" Let history ask this question of the Lindbergh child, Violet Sharpe, Richard Hauptmann, Ellis Parker and Dwight Morrow, all of whom were put to death in this conspiracy.